Tell me if you've heard this one before: "Linux and open source are the future of gaming." For longtime PC lovers, it's a familiar refrain, and one full of sadly misplaced hope and broken promises. But when those words are uttered by Gabe Newell—the co-founder of Valve, which owns and operates the insanely popular Steam PC gaming service—it's a tale worth rehashing. Newell has been a fervent hater of Windows 8, once calling the operating system "a catastrophe for everybody in the PC space" thanks to the platform's shift towards a less open, more iOS-esque software model. Speaking at LinuxCon yesterday, he reiterated the claim. "I think we'll see either significant restructuring or market exits by top five PC players. It's looking pretty grim," he said. "Systems which are innovation-friendly and embrace openness are going to have a greater competitive advantage to closed or tightly regulated systems." Newell's putting his company's money where his mouth is, too: Earlier this year, Valve released Steam for Linux, and Newell says that service now offers 198 titles—a mere drop in the ocean compared to the vast trove of games available for Windows PCs, but nevertheless a major leap in fairly short order. Popular Valve titles such as Half-Life 2 and Left 4 Dead have been ported over in a bid to blaze a trail for other game developers to follow, according to ArsTechnica. And beyond the software side of things, Valve's been tip-toeing into hardware with its Steam Box concept. The "Steam Box" (not a term yet officially used by Valve) would be a small form factor PC with gaming chops and Steam for Linux. Valve envisions various PC makers designing their own iterations of the Steam Box that would bring PC gaming to the living room. At LinuxCon, Newell said Valve would be "rolling out more information about how we get there and what are the hardware opportunities we see for bringing Linux into the living room"
If the future of PC gaming lies in Linux, somebody should deliver the message to today's players. According to Steam's own hardware and software survey, Linux is barely a blip on the gaming radar. The 64-bit version of Ubuntu 13.04, a.k.a. 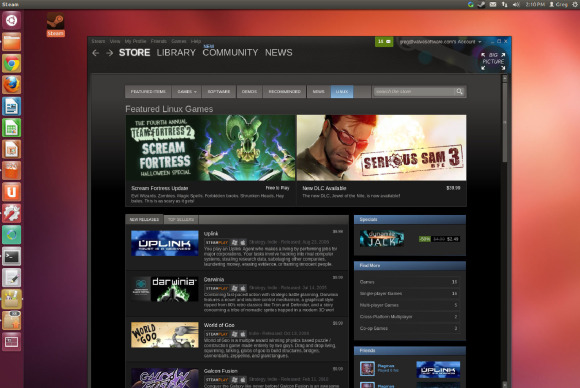 the most popular Linux OS on Steam, is used by just 0.40 percent of gamers. But make no doubt about it: One of the biggest gatekeepers in all of PC gaming is paving the path for a glorious future for Linux gaming, and for the first time in a long time, "Linux and open source are the future of gaming" is a phrase that actually inspires hope rather than weary resignation. There's no need to wait until some undetermined point down the line to get a glimpse of gaming's predicted path, however. Check out PCWorld's guides to building a DIY Steam Box and getting started with gaming on Linux to taste tomorrow today.